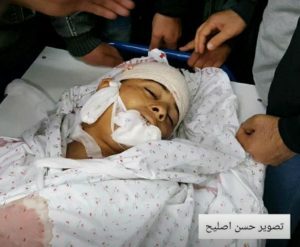 The Palestinian Health Ministry in the Gaza Strip has reported that a child died, on Saturday morning, of a serious gunshot wound he suffered, Friday, after an Israeli army sharpshooter shot him with a live round in the head, east of Khan Younis, in the southern part of the Gaza Strip. 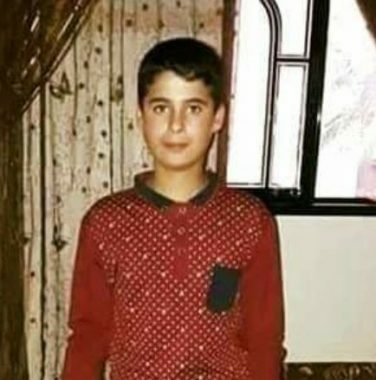 The child, identified as Azzam Hilal Oweida, 14, was shot by the Israeli army sharpshooter near the border fence east of Khuza’a town, east of Khan Younis. The Health Ministry said the child was shot in the head, and was rushed to the Gaza European Hospital, where he underwent an urgent surgery, but remained in a very critical condition until he succumbed to his wounds. On the same day of his injury, the soldiers killed three Palestinians, identified as Abdul-Salam Eid Bakr, 29, who was shot east of Khan Younis, in addition to Mohammad Amin Al-Moqyd, 21, and Khalil Na’im Atallah, 22, who were killed by army fire east of the Zeitoun neighborhood, southeast of Gaza city. The soldiers also injured more than 995, including at least 178 who were shot with live fire. 175 of the wounded Palestinians were injured in Northern Gaza, 251 in Gaza city area, 200 in Central Gaza, 146 in Khan Younis and 183 in Rafah. Their deaths bring the number of Palestinians, who were killed by Israeli army fire since the Great March of Return started on Palestinian Land Day, on March 30th, to 44 Palestinians, including children and journalists. on Friday at night, an Israeli drone fire two missiles at Palestinian fishing boats in the Gaza Port, completely destroying them.